Our new and improved, free standing cardboard display! A very attractive, full color, high quality display featuring our famous Payaso® brand, unique clown logo and colorful graphics. Place it anywhere. Impossible to miss and impossible to resist! 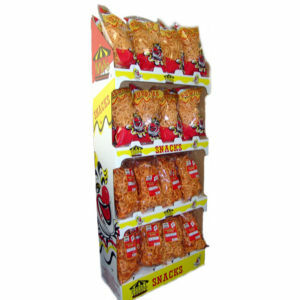 Perfect for displaying our Payaso® salty snacks such as Cheese Puffs, Rueditas(TM), Snack crackers, and many more. Our display is sturdy and refillable. Shipped as a single flat piece which can be assembled in less than 60 seconds.